It is one of the most common causes of hospital-acquired infections - but the type 11164 strain which infected the babies at the Princess Royal is highly resistant to the two antibiotics that are normally prescribed. In a statement issued on Wednesday, the health board said: "As previously reported, we have been rigorously managing a number of cases of a rare Staphylococcus aureus blood stream infection in extremely premature babies in the neonatal unit of the Princess Royal Maternity Hospital. "Three babies, who were extremely poorly due to their very early birth, sadly died and infection was one of a number of contributing causes in their deaths." They added: "As this was an extremely rare strain, which is highly resistant to the two antibiotics normally prescribed for S. Aureus and the skin cleaning agent routinely used in hospitals across the UK, we put in place a number of further infection control measures including the prescribing of different antibiotics and the introduction of a new skin cleaning agent." 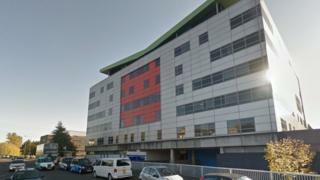 31 January: NHS Greater Glasgow and Clyde (NHSGGC) confirms it is investigating three cases - two of the "extremely premature" babies had died and the infection was "one of a number of contributing causes". The third premature baby requires treatment and is in a stable condition. 22 Feb: The health board confirms the babies had been infected with a rare strain of the staphylococcus aureus bacterium - 11164. The board says four other babies were found to have the type 11164 strain on their skin, but had not been infected.